Cakepops! Mmmm ... these look good. The Starbucks in my office building sells these in a few different flavors, but I've never tried one. They seem kinda pointless because I'm pretty sure I'd want three, and at that point I should just get a piece of cake or walk away. The droid ones are adorable, though. The birthday cake ones at Starbucks are pretty delicious. I like their red velvet whoopie pies too. The birthday cake flavor Starbucks cake pops are bliss on a stick. I'm so glad there's no Starbucks close by. Don't need that temptation. I'm totally making these for my wedding in TWELVE DAYS! 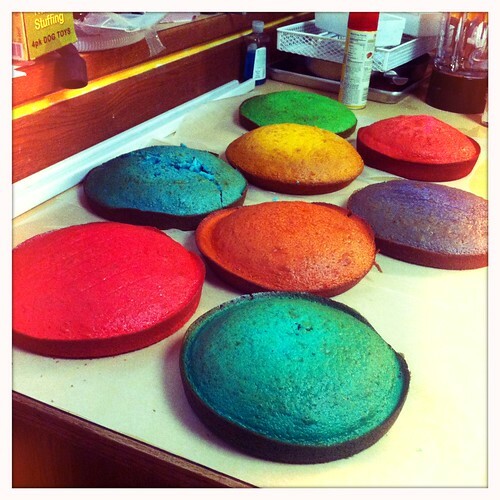 Four cakes worth in eight different colors. Finished all of the cakes today, will form the balls tomorrow and freeze. Then the day before the wedding will add the candy coating.